Weeds are plants out of place. In lakes, rooted plants may become weeds when they interfere with swimming, boating, fishing and other recreational activities. Native plants, those plants native to the lake, are for the most part beneficial. Native plants provide stability for the lake bottom, are habitat for various bugs and invertebrate animals, improve water quality and provide cover and habitat for fish. Prior to milfoil, an exotic plant, native plants sometimes posed a nuisance. The nuisances posed by milfoil are greater than those posed by native plants simply because it grows earlier, faster, denser, higher, blah, blah, blah. In addition, milfoil also causes harm to the ecology of the lake because it harms native plants (the good ones). So the imperative for controlling milfoil is much greater. I also hear that anglers like milfoil, so they argue it is also beneficial. It is true, in some areas game fish may congregate in milfoil and some anglers have learned to fish there. In this sense, milfoil is good for fishing. However, milfoil is not good for fish – for all the reasons I mentioned above – milfoil is not good for lake health. All that said, most anglers actually do not like milfoil. DNR’s regional fishery manager has told me he gets many complaints from anglers that milfoil interferes with fishing. So in Lake Minnetonka we have two kinds of weeds – good weeds and bad weeds. 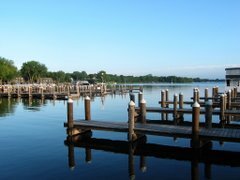 The Lake Minnetonka Association believes that our attention and focus should be on milfoil (the bad weed). Indeed, since I have been in this position (about 10 years), milfoil complaints have been and remain the number one concern. This does not mean that native plant nuisances have disappeared, rather they have been shadowed by milfoil. It gets even more interesting. There is some evidence that in some areas, milfoil or milfoil harvesting may have actually increased the overall abundance of plants! As milfoil beds become established, they tend to increase the accumulation of underwater soils, making that area more hospitable to any kind of rooted plant growth. Unfortunately this has also resulted in less diversity of plants, so many of the increased native plants tend to be those with “weedier” characteristics. In addition, research done on Lake Minnetonka and other lakes around the country demonstrates that milfoil grows back more quickly in harvested areas compared to un-harvested areas. Milfoil in Lake Minnetonka exploits both natural and artificial advantages making Lake Minnetonka weedier as a result. Controlling milfoil to restore Lake Minnetonka to a condition of having to deal only with “normal” weeds is a huge challenge because milfoil is tough and Lake Minnetonka is large. Last month, I wrote about the Lake Minnetonka Association’s Milfoil-Free Minnetonka campaign to highlight our plan to rid the lake of milfoil. This plan will require broad support, but it is technically do-able. Let us not forget there are other exotic plants nearing Lake Minnetonka. Hydrilla is more aggressive than milfoil, indeed it has been known to displace milfoil. Hydrilla is in Wisconsin. The Milfoil-Free Minnetonka campaign also has a strong prevention element because we do not want to add to the list lake problems.